'Genki' Dave has been a Martial Arts enthusiast since the age of 9 yrs. He started his Kempo Karate-do training in Whitby, ON under, Sensei Raymond Hayes (Soke). Later on in life, 'Genki' Dave studied GoJu Ryu Karate-do under, Sensei Bob Toth in St. Catharines, ON. 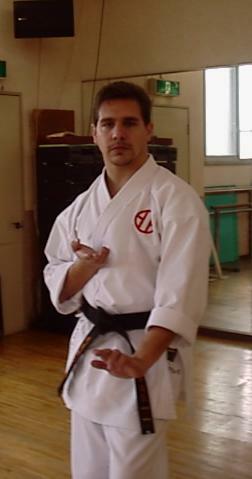 In 2003, 'Genki' Dave moved to Wakayama, Japan with his wife and children and desired to begin his training yet again, this time in Seito Shito Ryu Karate-do under, Hanshi Kazuo Sakai and Shihan Keiji Nakura in Osaka, Japan at Kongo Dojo. In 2004, 'Genki' Dave returned to Canada with his family, but kept on training in the same style and organization under Shihan William Chung in Richmond, BC. In 2015, 'Genki' Dave was awarded his Sandan (3rd Degree Black Belt) at the 10th World Shito Ryu Championships by the International Shihan Kai, consisting of the Japanese Executive Council, the American Shihan-kai and the Canadian Shihan-kai in San Fransisco, California - USA. 'Genki' Dave currently serves the B.C. Lower Mainland as an Armed Guard, enjoys reading, music and spending time with his loving family.